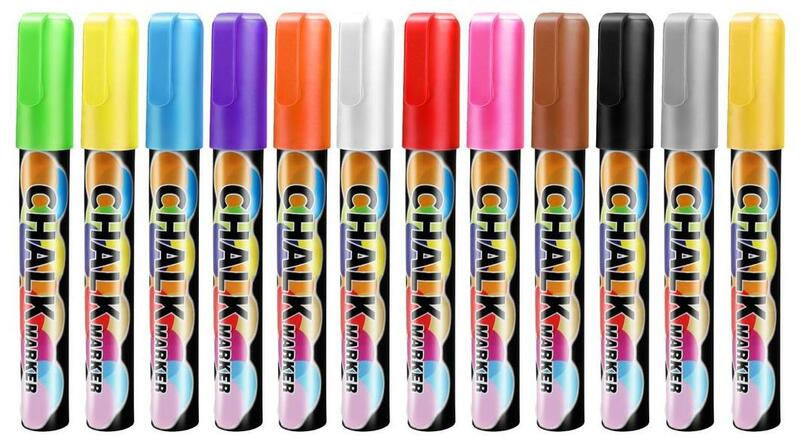 If you want to create artwork or designs on your chalkboard fridge or other erasable surface, you will probably like liquid chalk markers better than regular chalk. How to use: 1, Choose the tip 2, Shake the marker pen vigorously before each use until you hear the balls shake free 3, Pump the tip until all contents are mixed thoroughly 4, Start writing Use on: non-porous surfaces blackboards whiteboards glass, metal sealed ceramic tiles perspex enamel painted surfaces galvanised tin mirrors or any sealed surface. Feature: 1, PROFESSIONAL QUALITY INK: We use the finest ink that dries fast. It doesn't easily smudge once it is dried but can easily be erased with a clean and damp cloth! 2, ERASE EASILY: Wipes away cleanly from non-porous surfaces with a damp cloth. CAUTION: Does not work with chalkboard paint. Not all surfaces are non-porous. Always test first! 3, EXTRA DURABLE TIPS: Lightwish's high-density reversible marker tips are built for professional, kids and student use. 4, NON-TOXIC, ODOR & DUST FREE: Odorless, washable ink is great for indoor & outdoor use! It's also perfect for kids! 5, Create fantastic, eye-catching, attention grabbing displays! Specification: Assorted 12 Colors: Yellow, Pink, Orange, Green, Blue, Purple, Red, Black, Brown, White, Grey, Pale lemon yellow marker size: 14 cm/pc Dual-side Writing: Yes Package Quantity: 12 Colors/Box Packaging: Set Erasable Or Not: Yes Multi Colored: Yes Brush Tip: Bullet or Chisel General Tips: Keep nibs and tops of pens clean. Wipe with a clean tissue after use. Use a little household cleanser if ghosting occurs on some surfaces. Store pens on their side or upright with the cap to the top. Always ensure the cap in on tight.